It’s school holidays and the kids need some activity. What do you do? Well, you can spend an afternoon at Scienceworks, Melbourne’s very own interactive science museum. Recently, some junior maths masters did just that. They had great fun, racing wheelchairs, playing a transparent player piano, taking a guided tour of the night sky in the planetarium, pitting their strength against the closing jaws of a T-Rex, and much more. Definitely plenty of entertainment for the whole family. However, there were aspects that left the more senior maths masters much less impressed. On your next visit to Scienceworks, linger over one of the exhibits and observe how people actually engage with it. It will soon be clear that hardly anybody takes the time to actually figure out what is going on. Visits to Scienceworks clearly consist in the main of pushing any button in sight, watching to see if something flashy happens, and then moving on to look for the next button. Seldom does anybody take the time to read any of the accompanying explanations. So, Scienceworks typically acts as little more than a glorified playground. Still a worthwhile experience, but a great waste of a great opportunity. And yes, there are museums that do it better. The other, very large source of irritation for your Maths Masters is not difficult to guess: Scienceworks contains almost no exhibits that are even vaguely mathematical. Moreover, for the few semi-mathsy exhibits there are, the accompanying explanations fail to mention any of the mathematics, and are often misleading or plain wrong. For example, consider the exhibit pictured below. It consists of three slides starting at a common point and descending to the same level: a spiral slide of length 1.6 meters, a straight slide of length 1.75 meters and a curved slide of length 1.9 meters. 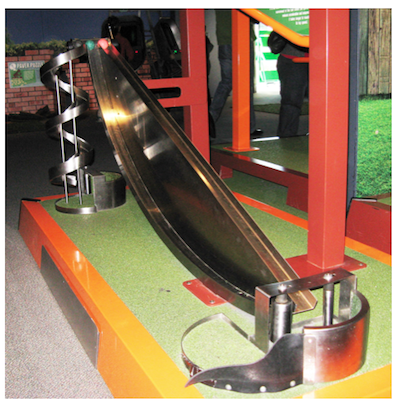 A lever allows balls at the top of the slides to be released simultaneously, and the visitor is invited to guess which ball will first reach the bottom. The clumsy wording hardly encourages visitors to bother with the explanation, and in this case they’d be wise not to: the explanation is vague, off the point and wrong. The comments on the spiral slide are dubious and distracting, but we’ll focus upon a more important problem: the issue of the “top speed”. 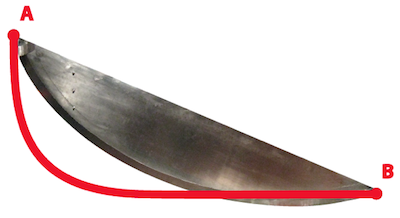 Consider the following photo of the straight and curved slides, with the red path indicating another possible slide. Would the red slide be (ugh!) “quicker” than the original curved slide? The very steep drop at the beginning ensures that a ball on the red slide will reach top speed very quickly. So, given Sciencework’s explanation, one may suspect that a ball on the red slide would reach the endpoint B more quickly. That is not the case. It is hardly surprising that the overall time taken for a trip depends upon much more than the top speed of a trip, or upon when that top speed is reached. In fact, contrary to the explanation provided, a ball on Sciencework’s curved slide will reach top speed very late in its journey, at the lowest part of the slide before the little rise at the end. No thanks to Scienceworks, we happen to know what is actually going on. The motivation for the display is a very famous and important piece of mathematical history, known as the brachistochrone problem. At the end of the 17th century, Johann Bernoulli challenged the leading mathematicians of the day to determine the “curve of fastest descent”, the fastest slide connecting two points A and B (assuming perfect sliding under gravity, without friction). The great Sir Isaac Newton accepted the challenge, though he was not amused: “I do not love to be dunned [pestered] and teased by foreigners about mathematical things …”. Using the newly invented calculus, Newton and others derived the surprisingly simple answer to Bernoulli’s challenge. It turns out that the curve of fastest descent will always be part of a cycloid, the curve traced by a point on a the rim of a wheel as it rolls along a straight line. 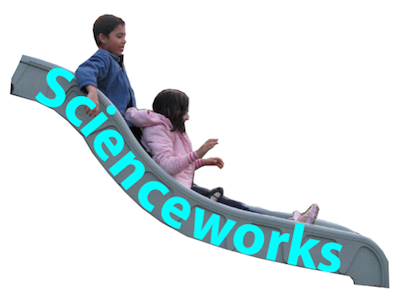 It is no surprise that Sciencework’s curved slide fits very nicely into a cycloid. Whoever designed the display knew what they were doing. But if the designer knew what they were doing, no one thought to share this knowledge. Wouldn’t it have been preferable for visitors to be offered some of the beautiful mathematics and history, rather than to simply be fed vague, pseudomathematical nonsense? To be fair, this is not a problem specific to Scienceworks. Most science education and science promotion in Australia demonstrates a profound ignorance of, if not contempt for, mathematics. But that’s another depressing topic for another depressing day. Puzzle to ponder: What is wrong with Sciencework’s description of the spiral slide?